Parents who create an effective estate plan, including making a valid will, get to determine where their assets go after they die. A parent can create a will that distributes property in any manner he wishes, including setting up a trust to care for property on behalf of his children. For example, if a parent has a child he knows is unable to properly manage money, he could design a trust to manage the money for that child while giving money outright to his other children. If a parent dies without leaving a valid will, he is said to have died intestate and his property will be distributed according to his state’s intestacy laws. State intestacy laws can vary widely, but children generally inherit the entire estate of their parent if the parent does not have a spouse at the time of his death. In Colorado, for example, a portion of a deceased person’s estate goes to his surviving spouse, but that portion varies depending on whether the deceased’s children are children of the surviving spouse. If a deceased father is survived by a new wife and children but also has children from a previous marriage, the surviving spouse is entitled to the first $225,000 of the deceased’s estate plus half the remaining estate. The remainder goes to the deceased’s children. If the father does not have any children with his new wife, she is only entitled to the first $150,000 plus half the remaining estate. Under Kansas’ intestacy laws, the deceased’s surviving spouse inherits half of the estate if the deceased had children and the children share the remaining half. Like other states, children of a divorced parent who was not remarried at the time of his death receive all of the deceased parent’s property. 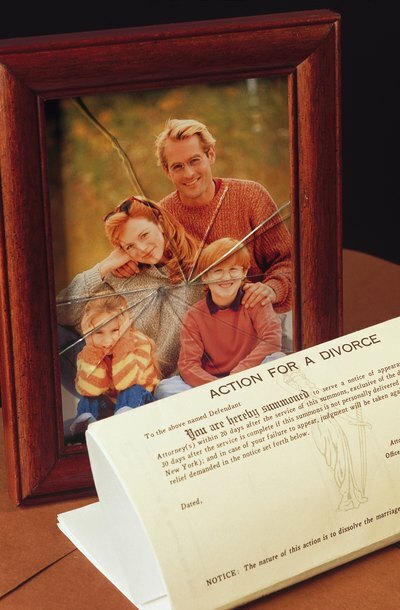 In every state except Louisiana, a parent, divorced or not, can disinherit any or all of his adult children. Parents are under no obligation to leave property to their children, so a parent could disinherit a child for any reason. But a parent must create a will to disinherit children, otherwise his property passes under the state's intestacy laws. Parents typically include a statement about the disinheritance in the will to avoid confusion if a child is simply not mentioned in the will. However, states can limit the scope of a parent’s power to disinherit minor children. For example, some states, like Florida, have laws that prohibit a parent from leaving his home to anyone other than his spouse or minor child. A child whose biological parents' rights were terminated by adoption may not be able to inherit property under intestacy laws from a biological parent because he is considered the legal child of his adoptive parent. For example, if a child is adopted by his new stepfather after his divorced mother remarries, he is considered the legal child of his mother and new stepfather. He can inherit from his biological father's estate only if he is specifically named in his will, but frequently cannot inherit from him under intestacy laws. In some states, like Texas and Wyoming, a child can still inherit from the biological parent even though state intestacy law does not allow the biological parent to inherit from the child unless the child leaves a will.